Paul Breitner (born 5 September 1951 in Kolbermoor, Bavaria) is a former German football player. One of Germany's most controversial players, he was capped 48 times for his country. Nicknamed “Der Afro” for his big curly hair, Paul Breitner was a starplayer at an early age. He signed for Bayern Munich when he was nineteen in 1970 and made his debut for the West German national team the following year. Paul started his career as a full-back, but moved up in midfield towards the end of his career. He had a very good right foot shot which he used frequently with great results. Breitner was a member of some of the finest teams Europe has produced. West Germany won the European Championship in 1972 and two years later, on home soil, they mopped up their second World Cup title. Breitner scored three goals from his defensive position, two long range thunderbolts against Chile and Yugoslavia and a penalty in the final against Holland. Also in 1974, Bayern Munich won the European Cup making it a fantastic year for “Der Afro”. At 22, he had already won everything a footballer could dream about winning. Breitner now searched abroad for new challenges. Real Madrid was next destination and he continued to win more trophies in the Spanish capital. When he came back to Bayern after three years in 1977, he had won two league championships with Real and a Spanish Cup title. Paul’s international career was in the meantime temporarily over. Disagreements with the coaching staff and certain players made him stay away from the West German national team for several years, but he changed his mind on the eve of the 1982 World Cup in Spain. Rummenigge was one of several players who said the team needed him after a run of poor results in the build-up to the finals. In his midfield role, Breitner guided West Germany to the final where Italy beat them 3-1. Breitner scored the West German goal making him only the third man, after Pelé and Vava, to score in two World Cup finals. He retired in 1983 having won many trophies including seven league championships in Spain and West Germany. Breitner was also named German Player of the Year once. His football career lasted from 1970 until 1983, mainly playing for Bayern Munich (1970–74 and 1978–83) and Real Madrid (1974–78), with one season playing for Eintracht Braunschweig. His early success was as a free roaming left back, as likely to score from the right midfield as to stop an attacker in his own penalty area. Later in his career he moved to midfield and became one of the top midfielders through the early 1980s. 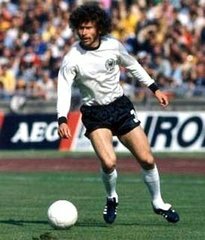 The early peak of Breitner's long and successful career was at age 21 in 1972 as part of the winning German European Championship team. This was followed two years later with victory as a member of the German World Cup squad. The final was played in Munich against the Netherlands, and Breitner scored the first German goal on a penalty kick. In the final, he, Franz Beckenbauer and Berti Vogts formed a slick unit at the back and their water-tight defense prevented the Dutch from winning the World Cup. He moved to Real Madrid following the World Cup and quit the West German squad, remaining off the side until enticed to return by Jupp Derwall in 1981. Breitner is one of only four footballers to have achieved the feat of scoring in two different World Cup final matches, sharing that honour with Pelé, Vavá, and Zinédine Zidane. He achieved this in 1974 against the Netherlands and in 1982 against Italy. During his club career, Breitner won seven National Championships with Bayern Munich (1972, 1973, 1974, 1980, 1981) and Real Madrid (1975, 1976), the Champions' Cup (1974) as well as the German (1971, 1982) and Spanish Cups (1975). During his spell with Bayern Munich, Karl-Heinz Rummenigge and he formed such a formidable one-two-punch that they were often called Breitnigge. By many of the older and more traditional football fans in Germany he was decried for his "revolutionary" attitude and his tendency for voicing strong opinions on political and social issues. 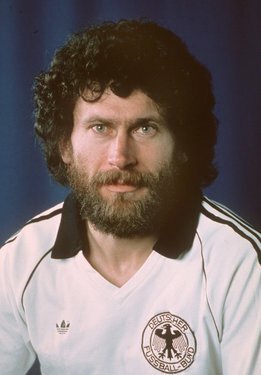 Before the 1982 World Cup (held in Spain) former "leftist" Breitner caused a major uproar in Germany when he accepted an offer by a German cosmetics company to pay him the – what many Germans regarded at that time as a "scandalously high" – sum of 150,000 Deutsche Mark if he shaved off his fluffy full beard, used their fragrance and advertised for the company. He currently works as a football commentator in Germany and is also an advisor to the Board of Bayern Munich. Basically the default stats with some minor changes done by me , I think the default stats go along with Paule from th early 80's like bread and butter , maybe his passing stats could be a little bit higher and even his AGG . I didn't give him *Middle Shooting , despite having a very powerful shot he didn't attempt this often to score from longer distances , he always preferd the dribbling or the final pass even when he was in promissing situations for a shot from 18-20 meters distance. Also what about DA? I'm not sure if he was really so good to warrant him 84..Maybe ATT can be in yellow, he was very effective when going forward and already in this era he played often in midfield..I surely see him better in ATT than R.Carlos..
Raised STA to 95.. I wouldn't here compare him with Oblak, Oblak stats are from Hajduk era and surely he ran more when he played for Hajduk and earlier in his career than in Germany.. I've read recently interview with him and he said that he ran less in Bundesliga than when he played in ex-Yu league.. in Germany he was a bit different player..
Dolaskom u Bayern promijenio sam se, postao sam više tehničar nego trkač. Bio sam zreliji, igrao sam iskusnije, smirenije. Concerning Breitner ATT, I can raise it to 79, but I wouldn't go in yellow zone in this aspect.. agree for DA, maybe 82 would effect better his style..